What Is An Emotional Affair? And Is It Really Cheating? 16 Undeniable Signs Of Limerence Symptoms And How It Relates To Infidelity. What do you want your life to be? Overcoming The Shame Of Infidelity-6 Ways To Get Free. Would your affair partner make a good spouse? Step One- Making the Decision and not turning back. you’re probably living daily with ambivalence. 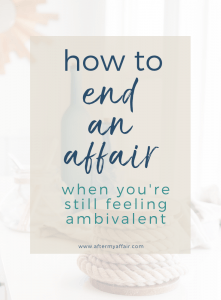 But we all know, when in an affair, we can’t stay ambivalent (or indecisive) for very long. Eventually a decision needs to be made or it will be made for you. I talk about this in my post Married but in love with someone else. It would be helpful to read about those 4 important choices in that article. You might have one foot in the marriage and one foot out. Meaning there may be half of you wanting to save your marriage and the other half wanting to stay with your affair partner. But staying ambivalent will only create more misery and heartache for your future, and the futures of those who love you. Even for your children. Many wayward spouses find themselves here. And unfaithful wives are no exception, feeling stuck and seeing no way out. It’s an overwhelming situation and one I know a lot about myself. You can read more of my story here. There seemed to be no way out of our situations, no matter which decision we make we know there will be pain. We don’t want to hurt our husbands or kids any more than we already did, but we also can’t imagine breaking it off with the AP. We often keep telling ourselves we can’t live without our affair partner. Sometimes we’re afraid if we chose the marriage we would forever be miserable or the it won’t work anyway. We are worried about the affair partner and how he would be if we break it off. I personally thought every one of those things myself. I’ve never experienced such conflicting feelings in all my life. I just couldn’t decide. Or, when I thought I was resolute in ending the affair and work on my marriage, my failed attempts just left me in more and more despair. Not to mention the extra damage I was causing my marriage and husband every time I chose the affair over him. So I stayed stuck and unable to move forward in either direction. After awhile, I became hopeless and even considered suicide to save my family from the shame of my choices and indecision. Also, It really helps to know WHY it’s so hard ending an affair. It helps to silence the voices in our head -screaming to us to go back to it. Check out my post 5 reasons why ending an affair is so hard. the other man than my husband. It was a lie! The back and forth almost ruined us for good because I kept listening to my feelings, which were all over the place. Do you relate to my story? The biggest reason people stay confused and unable to break off their affair is when they believe the lie that this is the right relationship for them. The affair becomes a ‘fantasy world’ that is hard to get clarity from. We call it ‘affair fog’. If it wasn’t such a common occurrence in affairs, there wouldn’t be a name for it. The thoughts in your head that say you are really supposed to be with this other person, not your spouse. So, if you are the wayward wife and you know you don’t want to split up your marriage but you’re also not sure how to end the affair, it all begins with the first very important step. The first step is to MAKE THE DECISION TO END THE AFFAIR, AND STICK TO IT. I realize that sounds simplistic. But if ever you were going to have resolve about something, do it now. Your feelings will fight against your decision hard at times. If you can remember that this relationship was not founded in real life, but a fantasy life, it will give you strength. I’m not saying you don’t have real feelings for your affair partner. Because I felt feelings too. But what is the foundation of your relationship? Was it founded on truth, honor and dignity? Was it a relationship separated from all the stressors of real life like bills, children, and running a household? They usually are. A perfect escape from our crazy lives, but not one that’s based in real life. If you’re really tired of living like this and really want to know how to end an affair, it starts by sticking firm to your decision to break it off. You’ve got to do everything you can to break free of the ambivalence that will keep you stuck. A. This is a decision you make yourself- not with your AP. The very fuel that keeps an affair going is the secretive nature of it. So, don’t confide in the affair partner first. If you discuss the options with the AP, what you’re really doing is creating more secretive unions with each other. That will lead to future excuses to follow up with each other in the future. You know, ‘just to see how he’s doing.’ Don’t do it. Guard against anything that will reopen the relationship. B. The other side of your ambivalence (the part that wants to stay in the affair) will kick and scream and fight you on this decision. Stay strong and push through it. It will get easier. Decide now what safeguards you will put into place to keep to your decision (i.e. block his number, or block him on social media, don’t go by his house etc…). This internal tug of war is part of the process of letting go of the affair. If you resume contact with him again, you’ve only set yourself back to the beginning in your healing. Don’t do it. C. Keep reminding yourself how miserable you’ve felt when you’ve compromised your own values and beliefs. Even if you think you are happy with him, there is almost always a degree of inner pain and turmoil. Ambivalence in moving forward with any decision will keep you stuck in your inner turmoil and chaos. Be true to yourself and do what you know is right. Also join our private facebook group (‘AMA women’) for support. https://www.facebook.com/groups/342125966386441/ Other ladies there know what it’s like). Write a list of reasons WHY this is the decision you must stick to. I found it very helpful to refer back to my list when the affair fog would try to convince me to call him again.